P/N 89190 Exhaust bellow. Note: this part is re-designed from the original OMC part, and contains additional outlet holes down the underside to relieve some of the back pressure created from the exhaust. P/N 89200 Drive shaft / u-joint bellow. Includes hose clamp. Replaces OMC 3854127, Sierra 18-2765, Mallory 9-72707. 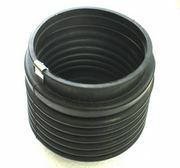 P/N 89210 Shift cable rubber cover. Replaces 911826, Sierra 18-2763, Mallory 9-72709. P/N 21905 Gimbal bearing. Heavy duty design allows for more grease filling, and low carbon steel can operate at higher temperatures. Replaces OMC 3853807, Mercury 30-862540A3, 30-60794A4, Sierra 18-21005, Mallory 9-72412. 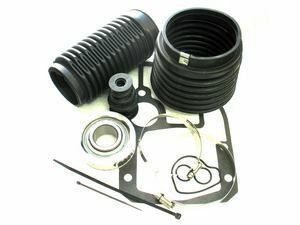 P/N 39630 Outdrive installation gasket kit. Installed between the transom housing and upper gear case when re-installing stern drive back onto boat. Make sure to use gasket compound on both side of gasket before installing (shown below). P/N 86560 Oil seal. Installed behind gimbal bearing. Replaces OEM 3852548, Sierra 18-8349. P/N 508235 Gasket sealing compound. Used on mounting gasket, and o-rings and internal sterndrive gaskets.